Iodine - 53I Your user agent does not support the HTML5 Audio element. 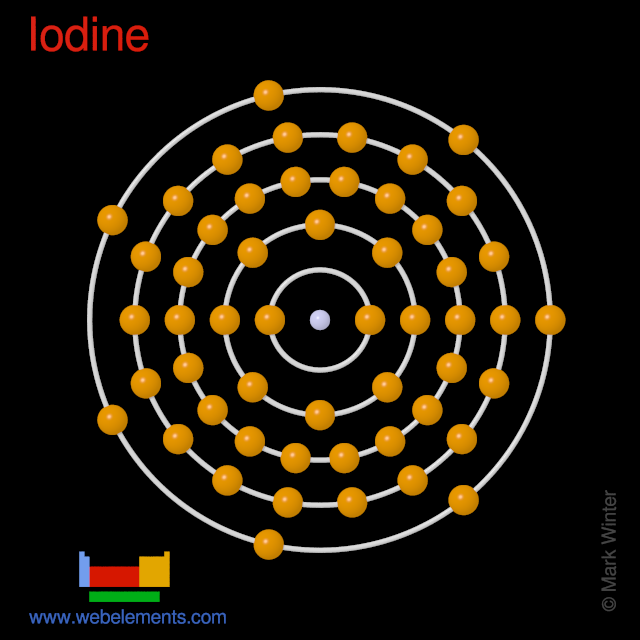 Iodine atoms have 53 electrons and the shell structure is 2.8.18.18.7. The ground state electron configuration of ground state gaseous neutral iodine is [Kr].4d10.5s2.5p5 and the term symbol is 2P3/2. 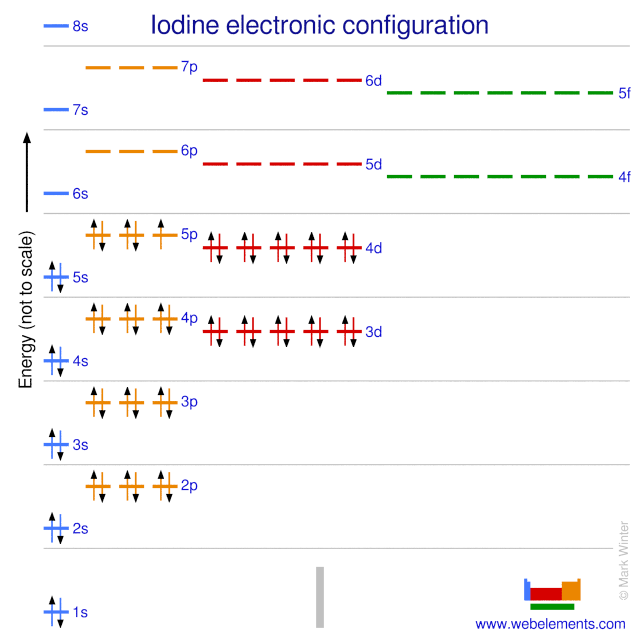 Schematic electronic configuration of iodine. The Kossel shell structure of iodine. A representation of the atomic spectrum of iodine. The electron affinity of iodine is 295.2 kJ mol‑1. 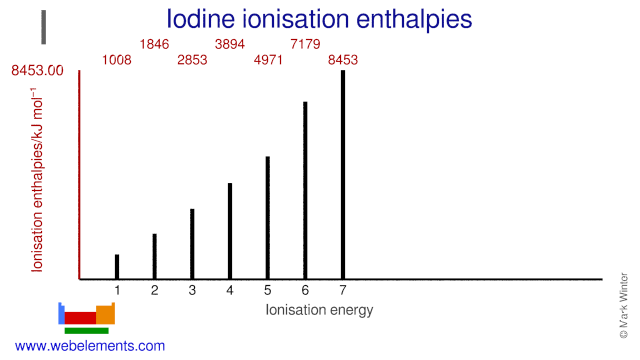 The ionisation energies of iodine are given below. The following are "Clementi-Raimondi" effective nuclear charges, Zeff. Follow the hyperlinks for more details and for graphs in various formats. Electron binding energies for iodine. All values of electron binding energies are given in eV. The binding energies are quoted relative to the vacuum level for rare gases and H2, N2, O2, F2, and Cl2 molecules; relative to the Fermi level for metals; and relative to the top of the valence band for semiconductors. I am grateful to Gwyn Williams (Jefferson Laboratory, Virginia, USA) who provided the electron binding energy data. The data are adapted from references 1-3. They are tabulated elsewhere on the WWW (reference 4) and in paper form (reference 5). D.R. Lide, (Ed.) in Chemical Rubber Company handbook of chemistry and physics, CRC Press, Boca Raton, Florida, USA, 81st edition, 2000.